Lake Baikal is one of the largest waterbodies in the world. Super clean water. Almost unbelievable is the fact that the lake contains almost a quarter of the earth's total liquid freshwater. 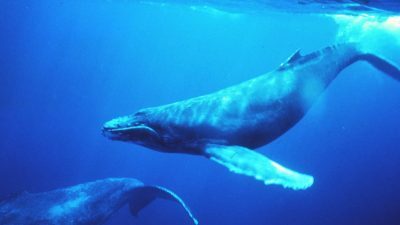 1,642 meters in depth and 673 kilometers in length, it could supply the entire human race with drinking water for almost 50 years. It is over 25 million years old and thus the oldest freshwater lake on earth. Huge numbers of impressive waters. The lake is part of a continental rift valley, the so-called "Baikal trench". The rupture increases by about two centimetres per year, with the Eurasian and Amurian continental plates drifting apart. This rift goes down six kilometres, but is filled with sediment. If this rift is taken into account, the depth record of a freshwater lake could be increased from 1642 meters to over six kilometres! Lake Baikal is rather unsuitable as a swimming lake, because the average surface temperature in midsummer rarely rises above 6 degrees Celsius. Nevertheless, it’s a popular destination: Fishermen and nature lovers visit the lake in all seasons and since a few years scubadivers discovered the lake, too. In summer, the cool, crystal clear water is fascinating. 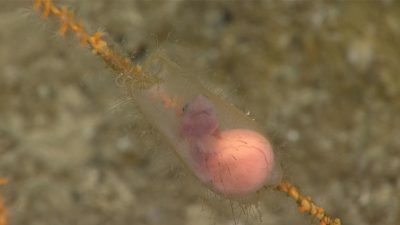 The ever-growing green sponges are unique, and additionally there are more than 300 species of waterfleas (Acanthogammarus maculosus). 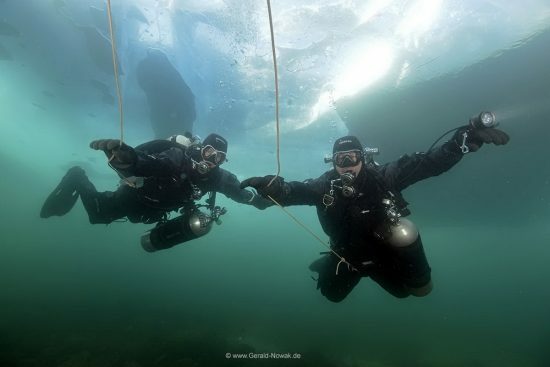 There is a "special" way to dive in winter, because Lake Baikal offers several exceptional variants of ice diving. 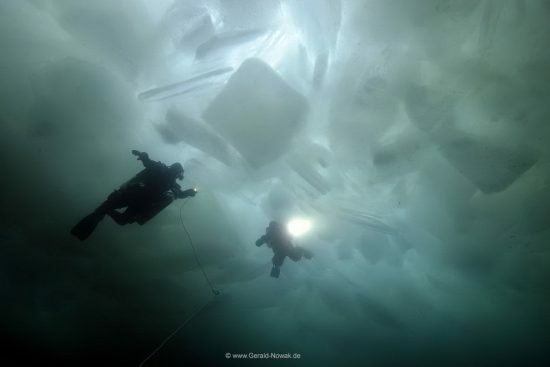 The ice - on average – is one meter thick; because of the crystal clear water one can see as through a glass pane. 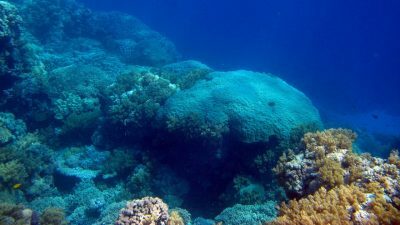 But there are also dislocations structures that are up to 10 meters thick. The icefield at the northern tip of the island of Olkhon is one of the most beautiful playgrounds for ice divers that you can imagine. Every year in early January, heavy storms rage on Lake Baikal. Typhoon-like winds blow over the lake from the northeast, “carrying” the frosty, cold minus temperatures of Siberia. 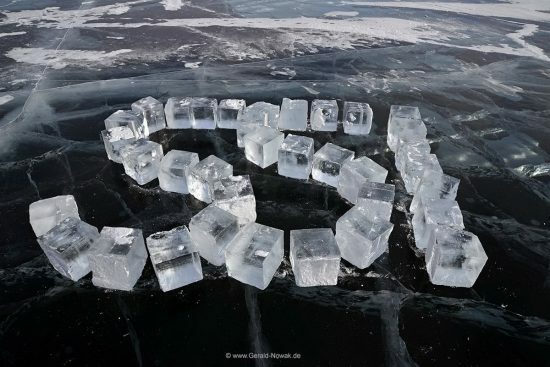 The water of Lake Baikal freezes almost in seconds, but the wind breaks the ice cover again and again. Ice floes up to one meter thick are created. Gusts push them against the northeastern corner of Olkhon and pile them there to an ever-increasing ice structure. Due to the weight of the ice, most of it is pressed under the water surface; Pack ice is built. The temperatures keep falling and reach 30 degrees minus and below. Now the rest of the lake freezes. Due to the enormous temperature difference between day and night and the temperature difference between the "warm" deep water which is flushed by currents up to the icy surface water, large cracks occur in the ice - up to the surface. However, these cracks freeze again every night. Aisles that can be very narrow, but also several meters wide and hundreds of meters long are built. 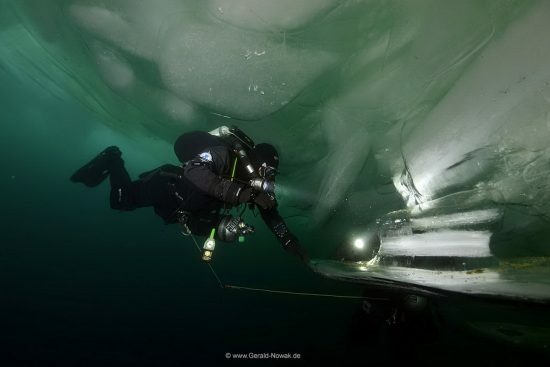 The best dive in the Siberian winter you can imagine. In the middle of January the weather calms down and from the beginning of February it is almost cloudless - over weeks. 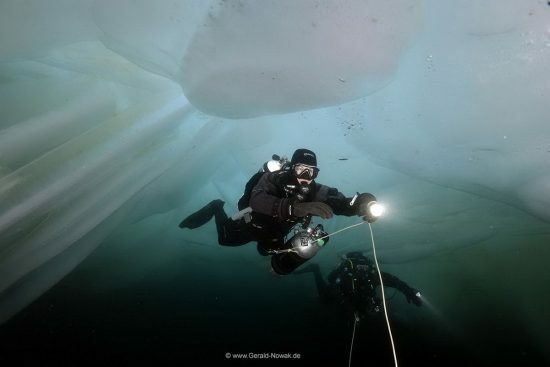 Ideal conditions for the "perfect" ice dive. 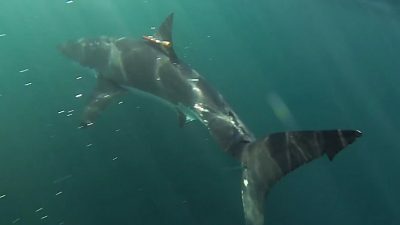 Usually one dive is enough per day, because the preparations take their time. After an hour under the ice, we are looking forward to the "Banja", the Russian version of a sauna. Mounted on skids, a trailer with a cab behind the transport vehicle is carried along. The trailer is used for changing and for warming up, but also as a sauna after the dive. A built-in wood stove ensures pleasant warmth. 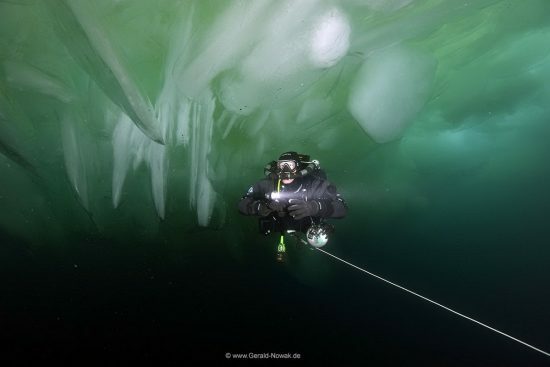 Since only very moderate depths - directly under the ice – are reached, the nitrogen saturation in the tissues is very low, so a sauna visit is possible. It is really great fun to jump into the lake directly after the sauna. You have to try it – it is less cold than expected. Anyone who still freezes after the Sauna is invited to warm up with a cup of vodka. Incidentally, drinking in Russia is much less than you might expect; even on the ice, the local police is present and checks the drivers. Anyone transporting guests must not drink anything: legal limit is 0.0! After the diving and the sauna we start a great journey of discovery. There are incredible ice formations, caves full of icicles, sparkling ice crystals in the evening light and also some places of worship along the island of Olkhon and the small islets in the sheltered bay. The shamanism is now officially allowed again and is practiced by some locals now. Directly behind the village is a sacred shaman rock: attraction for countless tourists, a perfect place for great photos in the evening light. In general, the lake and nature are a place for incredibly fascinating photos even in winter, which is why Olchon is not only a tourist magnet in summer. Who thinks he is travelling alone in the Siberian winter is wrong. 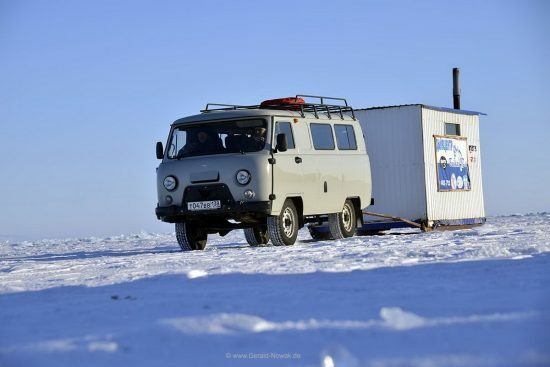 The region is visited by more and more people from all over the world, just under the ice, you are - together with your dive buddy – all alone in the icy world of the Baikal. A beautifully written article. 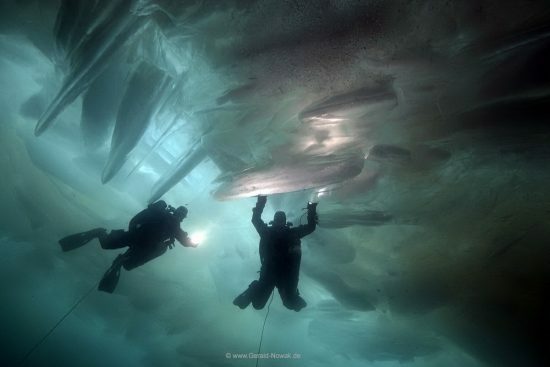 It makes me want to try ice dive. Most fresh water lakes have poor visibility. 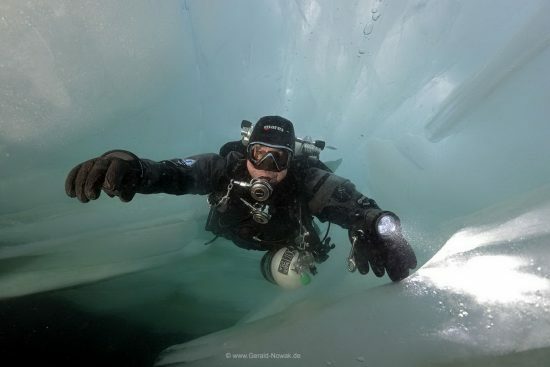 Would it still be interesting to do ice dive in poor visibility?